Titan Maximum is a stop-motion parody show. The first season is now available on DVD in the UK and I’ve had the pleasure of viewing it, here is my review of the series. Straight away I expected this show to be decent. For a start it is part of Adult Swim, and with Seth Green as the executive producer (he is the guy who does the voice for ‘Chris’ in Family Guy, also played ‘Scott’ in Austin Powers and ‘Oz’ in Buffy) you are guaranteed quality. Titan Force Five is a team of 5 individuals (see all characters) who together control Titan Maximum to protect the solar system. It sounds like a fluffy kids program, but these 5 individuals are actually bad mouthed unruly characters, leading to lots of arguments and sticky situations! As with all Adult Swim shows, the individual episodes are quite short, which means you can find yourself flying through the episodes. This is great when you just want to sit down and watch something funny for a bit, rather then a full movie. There are 9 episodes in total in Season 1. The DVD also includes a few nice special features, including a nice collected of 12 ‘Deleted Animations’ to watch, these are always a favourite of mine. Another great feature is ‘Behind The Scenes’, cool to watch to see how they make the show. You also get your usual commentaries, trailers etc. I expected it to be decent, and I wasn’t disappointed. It can take an episode or two to really get into it. And a couple of episodes are a tad unfunny and boring, but overall it is good. And it is a very original show which I really like. 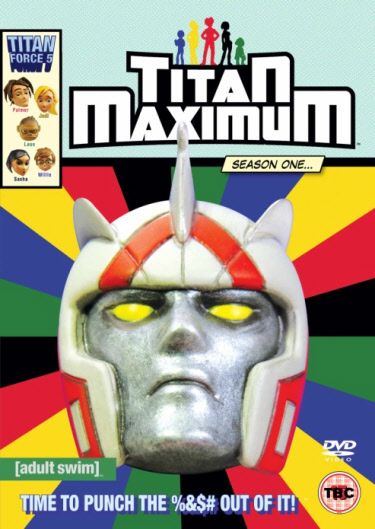 If you are into things like; Family Guy, Futurama, American Dad, Harvey Birdman, South Park and other similar shows then Titan Maximum is worth getting into!